The Mendenhall Glacier area is so enticing this time of year because the Mendenhall Lake (the body of water at the terminus of the glacier) is frozen in the winter, and it becomes an expansive playground for skiers, ice skaters, ice climbers, hikers, and other adventurers. My favorite part is hiking out to the giant icebergs frozen into the lake. There’s something remarkably serene yet perilous about those towering ice formations. From the safety of the lake’s shoreline, the icebergs look the size of knots on a log. But after trekking what seems like miles across the ice, one realizes these icebergs are massive, some the size of buses, some the size of homes. And this, my friends, is the moment in which I make the very clear statement: the glacier is never safe! Glaciers are unpredictable! Proceed with caution! UNSAFE, I tell ya! Becky and I naturally heeded that wisdom and after establishing a game plan of safety measures to attempt if one of us fell through the ice, we were on our way. But it didn’t last long. About five minutes into our hike across the ice, our steps became slushy and our boots began breaking through the surface. Now I don’t know about you, but when I start feeling the ice crack below me when I’m walking ON A FROZEN LAKE, I start shakin’ like a hound dog poopin’ peach pits. We made it to land, which I might add was covered in more than a foot of snow, and both of us were without snowshoes. It was one heckuva workout. We started on the trail to Nugget Falls, thinking that route was a safer bet, and we were psyched to try our cameras out on the icy waterfalls. After hiking a bit further, an enormous blue iceberg came into view, not far from an adjacent shore. Change of plans again, and we opted for the path less traveled. After many tentative and careful steps, we found ourselves face-to-face with a landscape of fused together icebergs. Each iceberg is unique, and upon closer examination, each one appears more and more breathtaking. The shades of blue are indescribable. “50 Shades of Grey”? Pfftt. These fifty shades of blue are more alluring. The cobalt, azure, cerulean, and even Tiffany blue tones are charming, downright captivating. I can’t get enough. And neither can the daring souls who climb aboard those icebergs throughout the winter, positioning themselves in the nooks and crannies carved by nature, hundreds of years in the making. Becky and I had a blast treading carefully around these humbling formations. On our way back, it was a chorus of laughter. 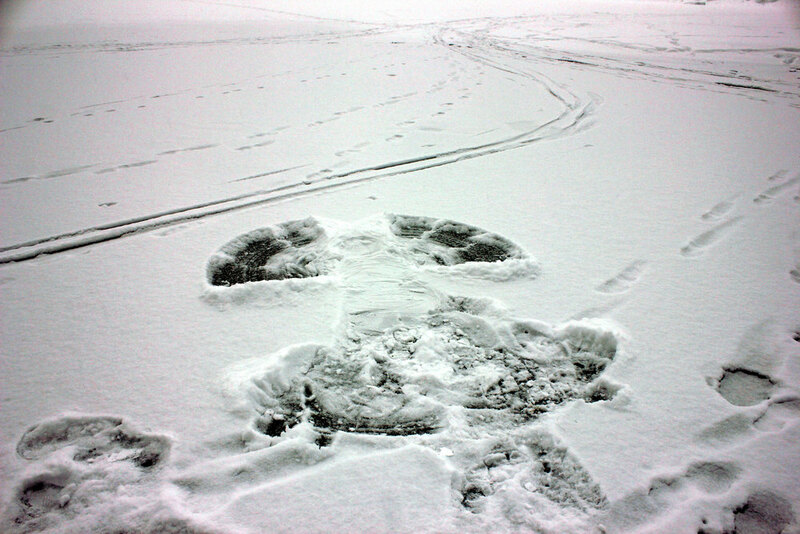 Snow angels were made, our bodies were frozen, but surprisingly not a single snowball was thrown. It took us awhile to unthaw, but our breathless wide-eyed moments out on the ice made it all completely worth it.